There have been many small things lately that I've enjoyed very much and wanted to pass on. It's the little things that make each day so sweet! I'd love to hear some of the little things you love in life, leave me a comment. 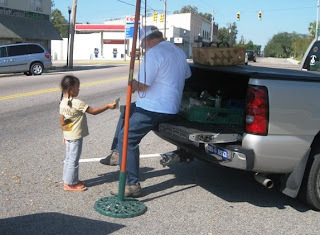 Small Town Saturday Morning - riding a bike in town, buying boiled peanuts from the back of a truck... Perfect. InsomniaCookies. Delivers warm cookies and milk to kids in university dorms all over America all night long. Or maybe just til 3 or 4 a.m.
Cupcake. Oh. My. they're sweet and delicious... tiny works of art that bring back the delights of childhood. They just opened a store in Columbia - two blocks from Starbucks in the vista. IFartGallery. OK, so it's If Art Gallery. But the name? Perfect. Gratitude Challenge. My niece participated in a Gratitude Challenge in which she had a different exercise for each day. I loved this one: List things you're grateful for in ABC order. I loved her list, too, it was inspirational and creative. Woot.com This site sells only one product a day. Every day it's something different. MorgueFiles. Need an awesome photo? Forget Flickr. This is the bomb diggity. The Pilgrim's Regress, by C.S. Lewis. The first book he wrote after his conversion. Revision of John Bunyon's Pilgrim's Progress. Allegorical. It's like every sentence could mean so many different things, outstanding. It's taking me awhile to read because I am a bear of little brain. Hearing "we go bye-bye??" when I visit the twins ... deep-belly laughs ... coffee at the KK (sans the smoke, preferably) ... campfires just 'cuz ... and, of course ... the Big Mo! !